Train to Italy – for people. for nature. At 6:30am the alarm went off and we packed up in record time (yesss, 30 minutes!) to get to the station with time for breakfast before the train. 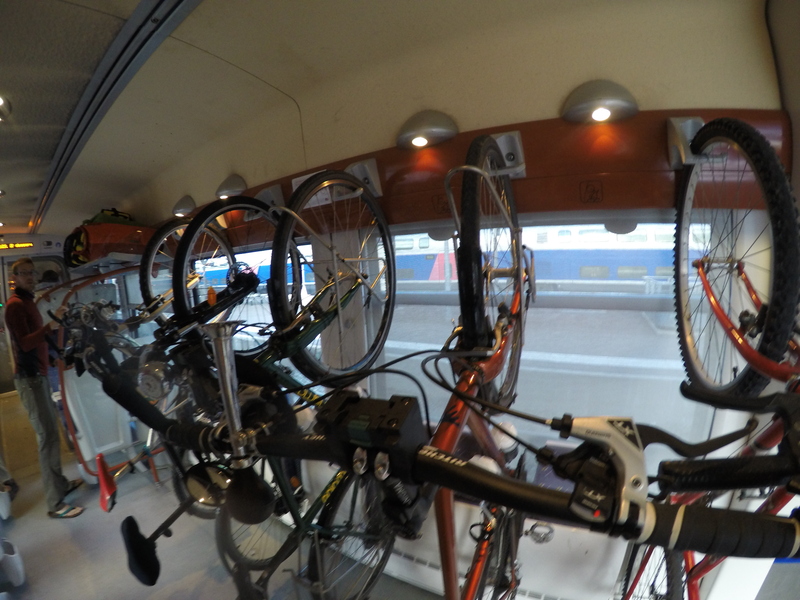 There were quite a few bikes waiting to get on, but luckily the train catered to our needs! The journey would take us along the coast to Marseille, then Nice, then across the border to Ventimiglia in Italy. 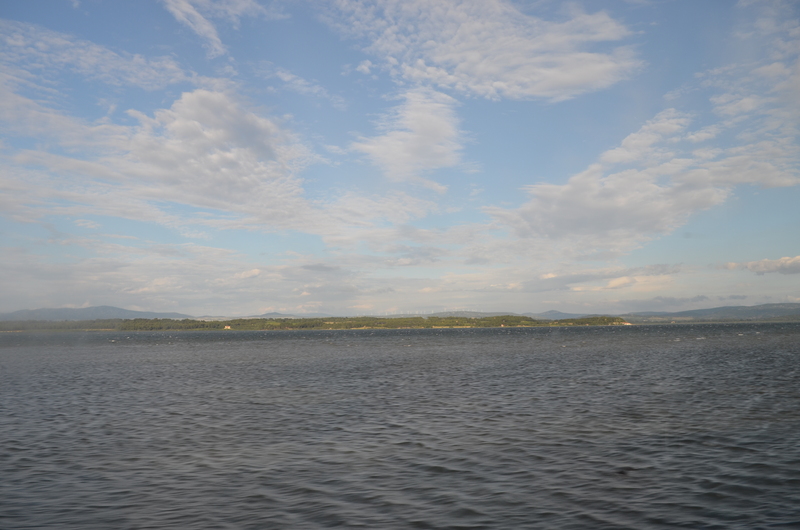 It was a beautiful journey – we even went over the sea for a bit! Nothing but water all around, the train tracks built on an artificial bank. 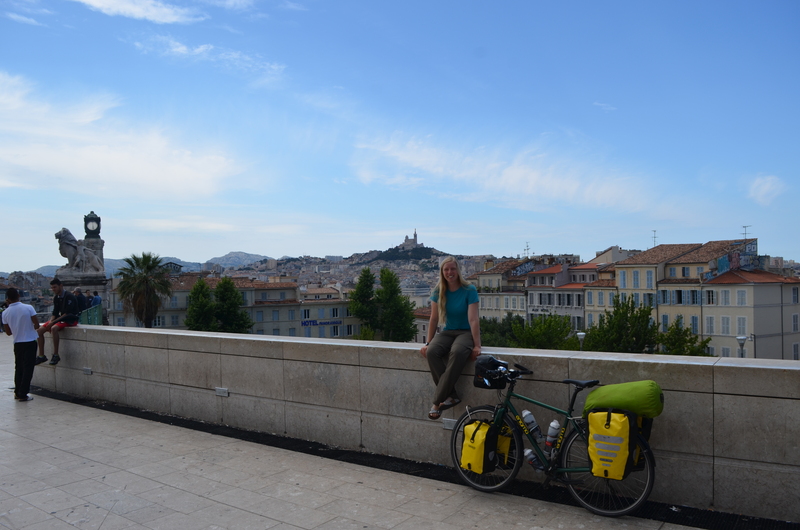 When we changed at Marseille, we had some time to spare and went outside to take a breather from the journey and the noisy station. The town looked pretty nice in the centre, but apparently has lots of problems with crime in the outskirts. The next train also had quite a few cyclists getting on but we all managed to squeeze in! The other five cyclists were also touring. We got chatting to a Chillean-French guy who was doing a holiday trip. 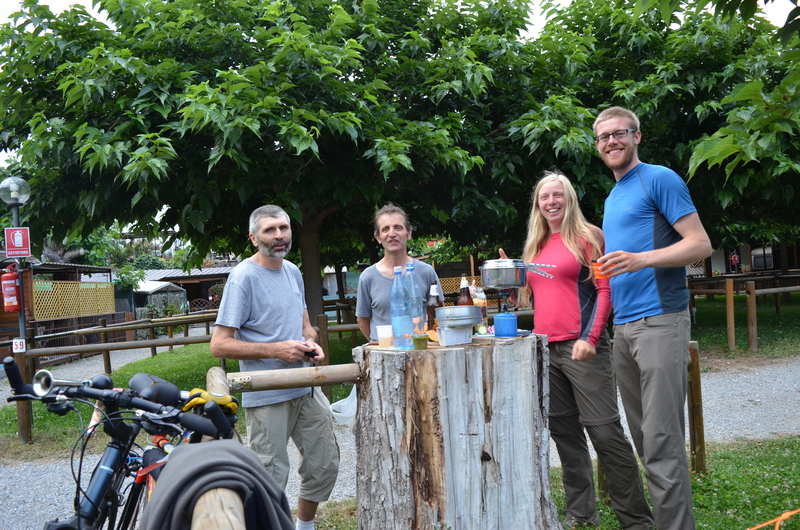 Then when he got off, we spoke to two Frenchmen travelling together. They had a bit of English between them and we attempted some horrendous French. We were all going to Milan, so were temporary travel buddies. 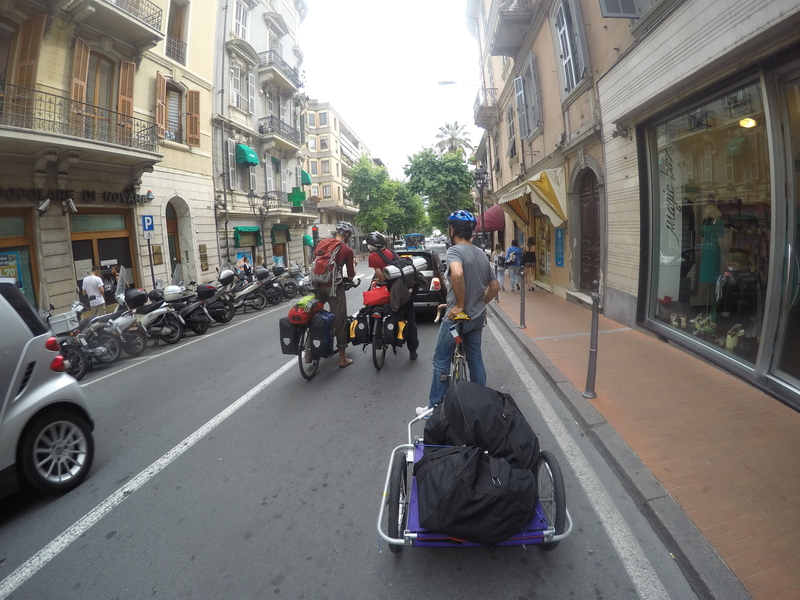 They were then heading to Venice to ride east along the coast through Croatia! When we changed trains in Nice, we spent ages on the platform waiting for the delayed train, which then tried to leave whilst Dave and I were loading our bikes. We had to hold the doors open to get in and the two French guys got left on the platform! 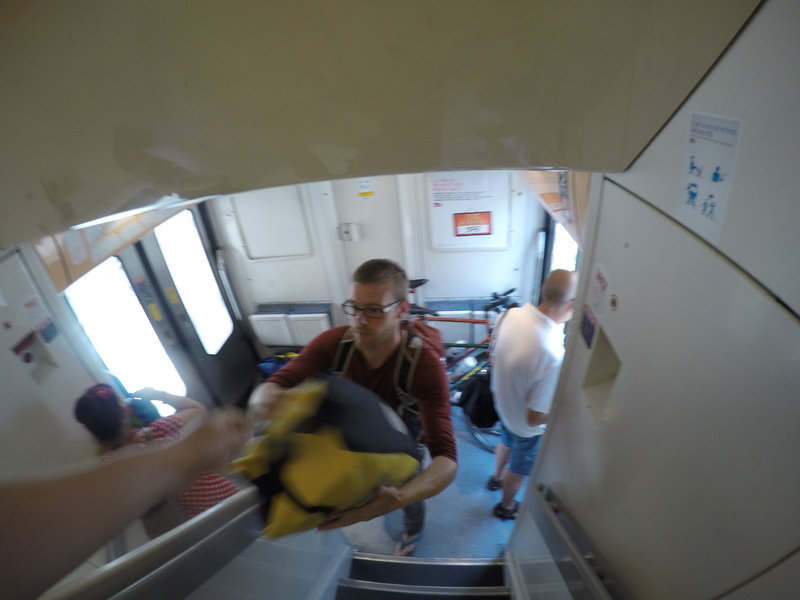 Oh, and there was nowhere for the bikes to go, so they were wobbling around in the corridor annoying the other passengers. But it was a short journey and we ate and chatted then got off in Ventimiglia. The two French guys were also there! They got a later train and we somehow arrived at the same time. None of us wanted to go any further that day. The station at Ventimiglia didn’t give the best impression of the town. The ticket queue was out the door, so we tried the automated ticket machine. The first thing it said when we pressed ‘English’ was “Beware of pickpockets”. Then we noticed a whole hallway in the station full of people sleeping on cardboard boxes. And armed police everywhere. We decided to head for the campsite. The traffic in town was very… um… Italian! Dave was a bit stressed out doing directions for the four of us. We were all over the road, bikes and baggage, with mopeds zooming around and lots of rush hour traffic. Not the best. We got to a big roundabout and I was in front with Dave trying to tell me which exit to take. Then we ended up on what appeared to be a motorway! At that point, we were committed to carrying on to the next exit and I pedalled like mad in front, not wanting to stay on that road for longer than necessary. When I got off the exit and into a nice safe hatched area, I looked behind and only Dave was with me! We waited for Gerard and Jean-Marie to appear safely and apologised for taking them on a motorway. Oops. Then we had to take a detour back to the right road and found the campsite. We checked in and asked the guy about the people sleeping at the station. He said they arrived on a boat from somewhere in Africa and they wanted to get into France, but France wouldn’t let them in, so they were trapped in Italy. Sounds awful, being stuck somewhere far from home, waiting for someone in an office somewhere to decide what to do with you! The campsite was between a busy road and a railway, so we found a pitch as far from both as possible but it was still noisy. We were tired and hungry and unhappy about the last two days. Whatever happened to the peaceful Portuguese roads, the mountain scenery and cheap food? Stupid tourist coast. Happily we found a nice shop and stocked up on pasta pesto, cheese and bread for dinner. The four of us ate together and had nice chats. Jean-Marie works in a butchery and brought some of his own made cured sausage to dinner, which was delicious. A few beers later and we were ready for bed! Another travelling day awaits… Ugh.